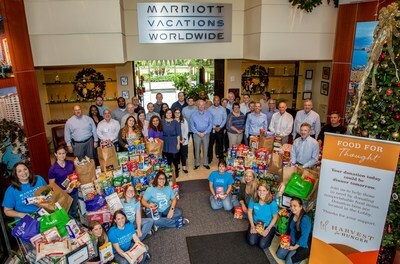 ORLANDO, Fla., Jan. 23, 2019 /PRNewswire/ -- Marriott Vacations Worldwide (NYSE: VAC) is committed to the fight to end hunger with its annual Harvest for Hunger food drive. The month-long initiative — which takes place from November 1 through 30 — encourages associates, Owners and guests at participating resorts and Marriott Vacations Worldwide offices around the world to share in the spirit of the holiday season by donating nonperishable food items to benefit local food banks. This year's donations totaled more than 55 tons — or 110,000 pounds — providing the equivalent of more than 91,500 meals for people in need. The drive once again exceeded its ambitious donation goal, surpassing last year's collection by 10 percent. "The opportunity to help those in need is tremendous, and I could not be prouder of the continued generosity of our associates and their efforts to combat hunger," said Stephen P. Weisz, president and chief executive officer. "Programs like Harvest for Hunger are wonderful representations of our associates' and Owners' commitment to giving back, especially during a time of year when members of our community may be struggling." Launched in 2015, Harvest for Hunger has collected and donated more than 160 tons — or 320,000 pounds — of nonperishable items for community food banks around the world. Globally, approximately 800 million people are at risk of hunger — including children, seniors, families and military veterans. Marriott Vacations Worldwide is committed to giving back to the communities in which their associates live and work and in which their Owners and guests vacation.